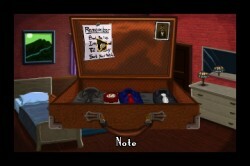 Enjoyable game play mechanics and some fun puzzles. Time period works for a setting. 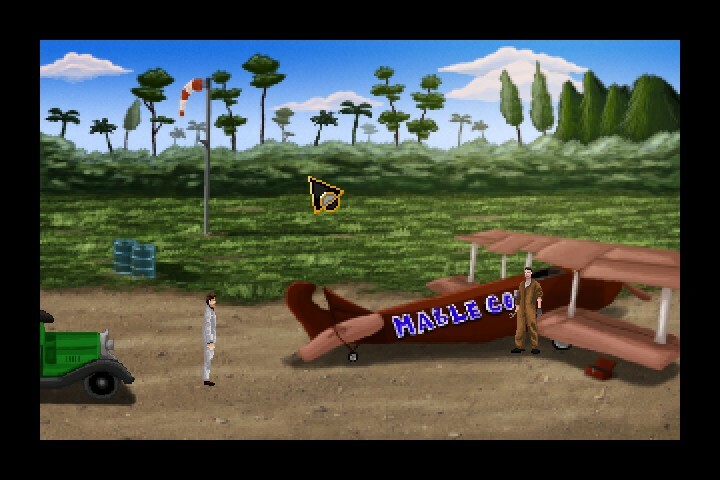 A Golden Wake is a retro-styled adventure game developed by Grundislav Games and published by Wadjet Eye Games about Alfie, a real estate agent trying to make something out of himself in Miami in the 1920s. It opens up in New York City in 1921, and it’s just a typical snowy work day for Alfie who stops to shoot the breeze with the local paperboy before heading into work. Alfie’s jovial demeanor isn’t shared by his coworkers who are upset with him and his job performance. It’s not that Alfie is bad at his job and that’s why they’re upset with him, it’s actually the opposite with them claiming his success is due to favoritism. Every month Alfie has the best sales and they believe it’s due to the leads he receives and they conspire to get him fired so neither one of them lose their job. So when their boss leaves for part of the day, they use the opportunity to distract Alfie and then frame him by hiding the sales leads for the day on his desk. As a result Alfie would end up losing his job despite being the best salesman in the office by far. And since the newspapers have been talking about a potential real estate boom in Miami, Alfie decides to start fresh in Miami and make a name for himself there. But it won’t be as easy as it might seem with organized crime flourishing during Prohibition as well as Mother Nature’s impact on the area. Can Alfie succeed in the face of all these challenges or will he become just another forgotten story during the upcoming tumultuous times? 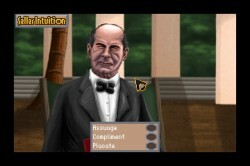 The controls are the standard point-and-click scheme with the left-click used to interact with an object and the right-click to look at an object. You access the inventory by moving the cursor to the top of the screen, and when you select an object the cursor blinks while the name of the selected object shows at the bottom left of the screen. The first sequence in New York City is relatively short and is pretty much just a setup for Alfie to travel to Miami, and the game truly begins. The big fish in town when it comes to real estate is George Merrick but before Alfie can even meet him to get a job, he has to perform a task that would be impressive enough to get his attention. This would be done with the help of Doc Dammers, who Alfie happens to meet as soon as he arrives in Miami, and an enjoyable gameplay mechanic that unfortunately doesn’t appear often enough. The way to impress Merrick is through real estate sales so you’re put in the shoes of a salesman and have to match up prospective buyers with the house they desire. This is done through an interactive screen that lists the buyers on one side with a description of what they’re looking for in a house and neighborhood and on the other side are the houses with a description of their amenities. And once you click and drag each person’s icon to the correct house you’re able to proceed. Despite this mechanic not appearing often there are other ways A Golden Wake tries to make you feel as if you’re a real estate agent extraordinaire, and that’s through the Seller’s Intuition feature, although that’s not just used in trying to make sales but to persuade people to your advantage. This is used on a number of occasions where you basically have to choose specific ways to respond to someone based on what was revealed about them in their brief dialogue ahead of time. Hovering over a choice gives a little more insight into it. For example, there’s a situation where Alfie has to persuade a bank robber to turn back knowing this is most likely his first crime and he doesn’t want to go to jail. You can make the wrong choices during these Seller Intuition moments, and in that case you’ll have to find another means of solving a puzzle or persuading someone. 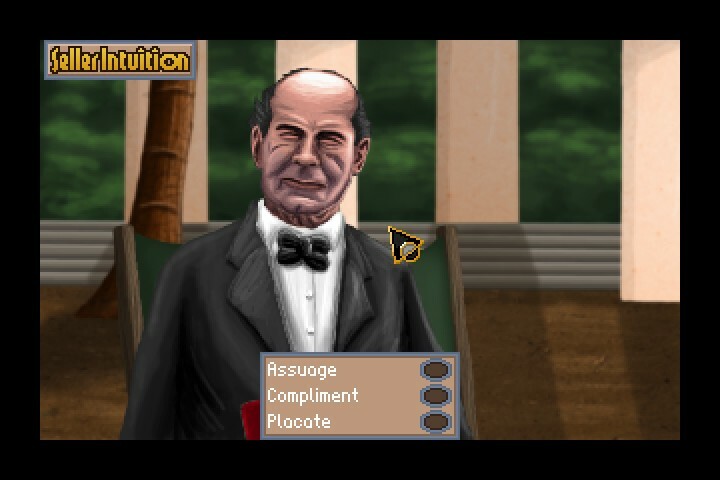 The general puzzles were pretty straightforward and not difficult to solve if you’re accustomed to playing any type of adventure games. There were a couple of occasions where the puzzles took some extra thinking about what to do, such as working with a stunt pilot, but even those weren’t too complicated, and so the game could be advanced fairly quickly. I was very intrigued about the time period selected and saw a lot of potential in the story whether it was the Roaring 20s, the impact of Prohibition or the angle with organized crime. When A Golden Wake opened up in New York City and then Alfie decided to move to Miami I felt it because of the change in scenery along with the engrossing start that made Alfie a sympathetic yet ambitious character. And when he first arrived in Miami and I was walking on the main street I felt like I was transported to that time period and had to go about making a name for myself. And the initial tasks assigned to Alfie by Merrick only pulled me into the time period and the city of Miami even more as each one varied enough to create a general understanding of both. However, when situations would change due to time advancing or one of Alfie’s accomplishments helping Merrick’s business grow, I didn’t feel these changes as much as I should have. Unlike the way Alfie sold real estate to prospective buyers, I wasn’t sold completely on any of the monumental changes taking place in the story. I liked the story but didn’t love it as if it was my own. And that’s because the story doesn’t sink its teeth into any of the subject matter it deals with so the impact of the events taking place is lessened. We’re not shown how the real estate market boomed in the area or the changes to the area that made Alfie eventually feel he deserved so much more. This is only done through Alfie’s words or his role in presentations. And since he feels like a transient throughout most of the game because he was never shown to have a home or at least shown working late so his job essentially was his home, the impact isn’t even seen in changes in his life until late. Now, I understand that his main trait was being driven however I wish he was developed further so he would be a more engrossing character. I’m not stating that the story wasn’t enjoyable at all because it was quite enjoyable in its different phases. It’s just the overarching narrative tying the different phases together wasn’t as compelling as I hoped it would be. However, it was definitely worth the trip. 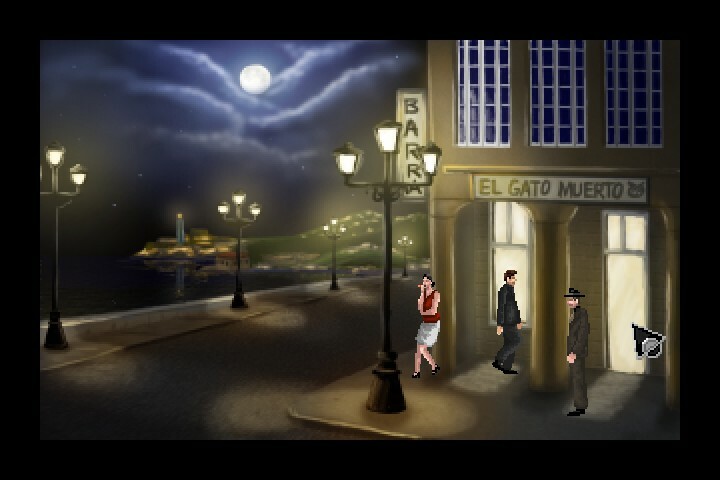 A Golden Wake is an enjoyable adventure game that benefits from its reverential nod to retro adventure games while adding its own entertaining game play mechanics. 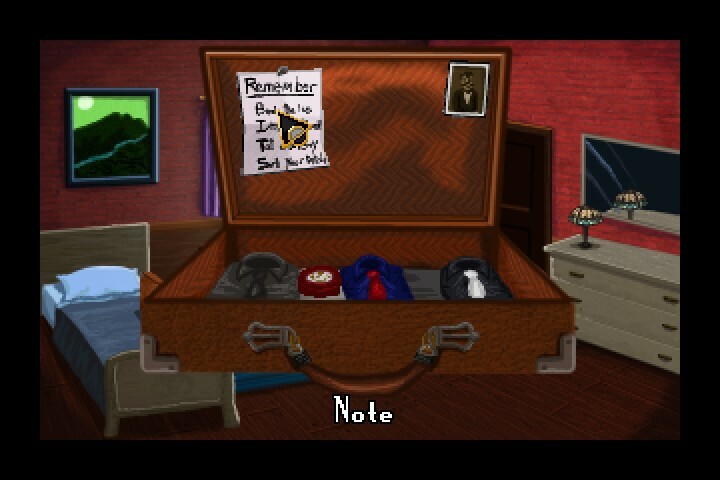 The general puzzles are pretty straightforward but the puzzles that try to reflect Alfie’s position of being a real estate agent extraordinaire, even when he uses those talents for organized crime, are easily the most fascinating. The time period covered was a great choice but I feel the game didn’t take full advantage of it to create a fully engrossing experience. And part of that was due to Alfie’s lack of personal narrative and feeling invested in the changes during this time period. 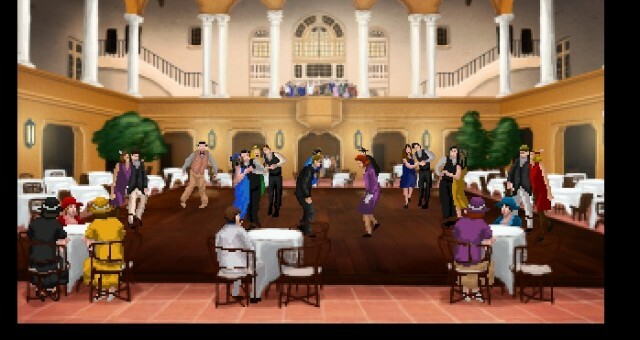 However, if you enjoy retro style adventure games then I definitely recommend giving A Golden Wake a try. You might be swept away.